While some San Jose firefighters continued to battle the blazes burning in the North Bay, crews back home were kept busy Sunday fighting mulitpes fires. Kris Sanchez reports. 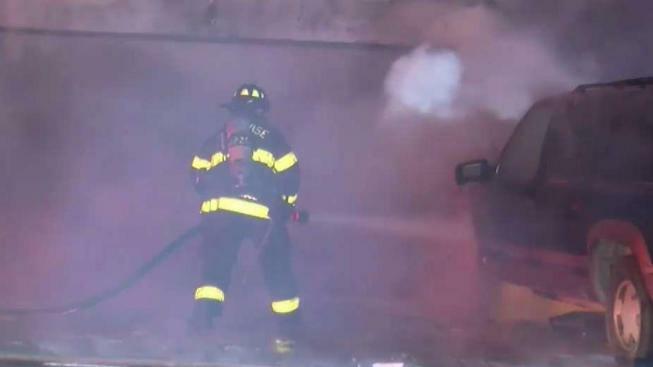 While some San Jose firefighters continued to battle the blazes burning in the North Bay, crews back home were kept busy Sunday fighting multiple fires. Firefighters in the South Bay city responded to a brush fire in the foothills that quickly spread to two homes. Crews were later dispatched to another brush fire and possible rescue in the hills above Alum Rock Park. Just as the calendar turned to Monday, firefighters battled flames that shot out of a home on Sonata Way. Firefighters in San Jose are working longer shifts to cover for the three engine crews that are offering assistance across North Bay counties. "We've been on since about 8 o'clock this morning," San Jose Fire Department Capt. Brad Cloutier said as crews worked at the scene of the house fire. "We'll be on for about another 36 hours. Yeah it's been a long day so far already." When crews arrived at the house fire just after midnight, they thought the family might have been trapped inside, but they later determined that the house was empty. The garage was overwhelmed by the towering flames, which also spread to other parts of the house. The house has since been boarded up, and the family is staying with relatives in the area.